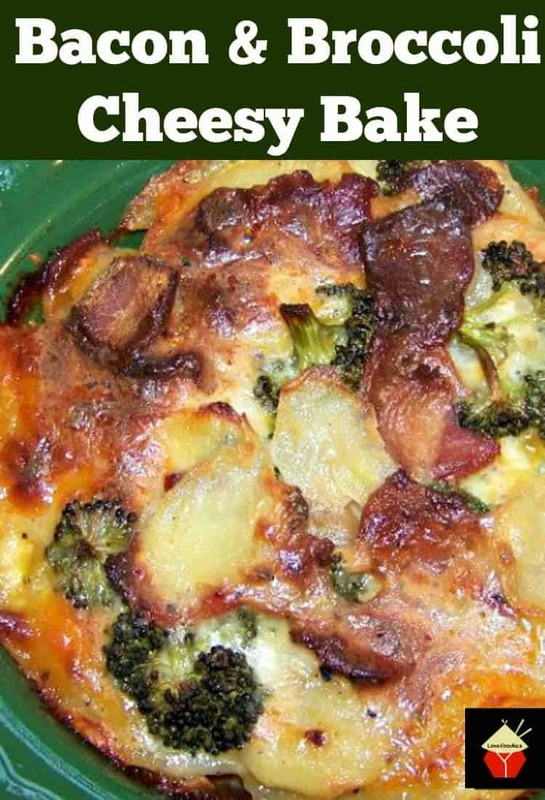 Bacon & Broccoli Cheesy Bake – Quick, easy and very delicious! Cathy is always cooking delicious Home made dishes, and just loves to cook. 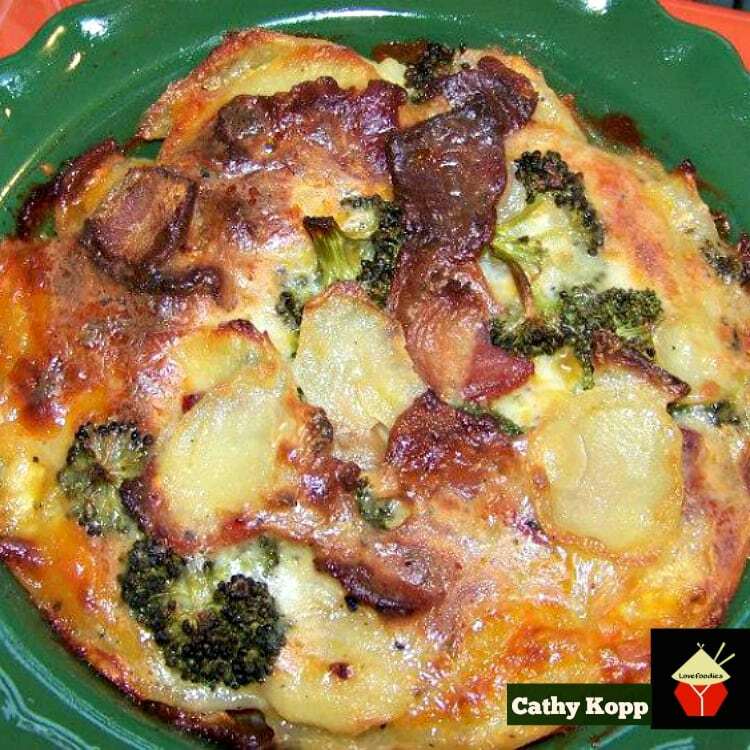 Here, Cathy’s Bacon & Broccoli Cheesy Bake is incredibly easy and got TWO thumbs up from her hubby! Cathy has been lucky enough to have a bumper harvest of broccoli and has made this recipe up to share with us all. 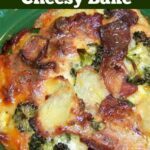 There’s something for everyone in here, from bacon, to cheese, to potatoes, you can serve this as a side dish or a meal in itself. Whatever you decide, it’s guaranteed to be delicious! Thanks Cathy for showing us one of your favourite family recipes. Salt & Pepper *** see notes at the end of recipe. 3. Put potatoes, milk, and salt in a medium saucepan over medium heat. Bring to a high simmer (do not boil), lower heat and simmer for 15 minutes, stirring occasionally. 4. Crisp the bacon in a fry pan and then remove to a paper-towel lined plate to drain. 5. Discard most of the bacon drippings; reserving about 1 tablespoon. 6. Saute the onion in 1 tablespoon of bacon drippings. 7. Using a slotted spoon, layer 1/2 the potatoes, onions, bacon, cheese and broccoli in the casserole dish. 8. Repeat the layers. Save some cheese for the top! 9. Pour the milk that the potatoes were simmered in over the casserole dish, pushing the layers down into the milk (add more milk if needed). Bake for 30 – 40 minutes until sauce is bubbly and potatoes are tender. Sprinkle with more cheese if desired on the top. Potatoes normally need lots of salt. The bacon and cheddar cheese have lots of salt in them. I normally sprinkle the potato layers with some salt and pepper, but don’t go overboard. You can always add more salt when eating … you can’t take it back out. Some people skip the potato simmering in milk step, but I prefer to know that the potatoes will be tender. If you prefer, just layer it all and then bake for 50 – 60 minutes. Put potatoes, milk, and salt in a medium saucepan over medium heat. Crisp the bacon in a fry pan and then remove to a paper-towel lined plate to drain. Discard most of the bacon drippings; reserving about 1 tablespoon. Saute the onion in 1 tablespoon of bacon drippings. 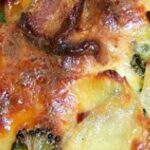 Using a slotted spoon, layer 1/2 the potatoes, onions, bacon, cheese and broccoli in the casserole dish. Repeat the layers. Save some cheese for the top! Pour the milk that the potatoes were simmered in over the casserole dish, pushing the layers down into the milk (add more milk if needed).